I love roasted garlic. Raw garlic has a bite, and don't get me wrong it definitely has its place, but roasted garlic has this earthy, mellow, savory taste. Roasting it takes the bitterness away, and can alter flavors completely. A head of garlic is a cheap way to boost the taste in soups, pasta dishes, or just spread on toasted bread. If you purchase a sleeve of garlic, often you get 8 or so heads, and what do you do with all that garlic? Roast your own garlic of course! Roasting your own garlic only takes about 30 minutes, a little olive oil, and a 350 degree oven. Here is the simple technique that I use for roasting garlic. Preheat oven to 350 degrees. Chop the garlic head's top off (this sounds more morbid than it really is). You are going to remove about the top 1/2 inch from the garlic head. 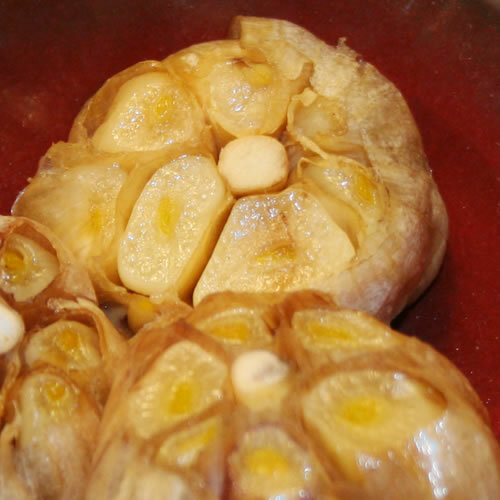 On a foil lined baking sheet, place your garlic heads, and pour on between 1-2 tablespoons of olive oil (per head). Bake the heads for about 30 minutes (you will know it is done when the garlic is soft). After they have been removed and are cool enough to handle, separate the cloves from the skins. Store in an airtight container and keep refrigerated for up to two weeks. You can also mash the garlic, squish into an ice cube tray and freeze, once frozen move to a zip top freezer bag, and use a cube when needed. You can do several heads this way, and your house will fill with the savory scent of roasted garlic.